Despite the frequent appearances of Osama Bin Laden and Ayman al-Zawahiri on television screens worldwide, Al Qaeda remains an elusive entity. As the world has grown increasingly familiar with the spectacle of Islamist terrorism, Al Qaeda's essential worldview has remained bewilderingly opaque. To reveal its inner workings, Gilles Kepel and his collaborators, all scholars of Arabic and Islam, have collected and brilliantly annotated key texts of the major figures from whom the movement has drawn its beliefs and direction. The resulting volume offers an unprecedented glimpse into the assumptions of the salafist jihadists who have reshaped political life at the beginning of the third millennium. Excerpts from the work of Azzabdallah Azzam, Ayman al-Zawahiri, Osama Bin Laden, and Abu Musab al-Zarqawi--drawn from speeches, internet postings, and published writings--tell the story of Al Qaeda's evolution, from its origins in the Afghan war through the war in Iraq. These texts reveal the rational, discursive mode used to persuade and to justify violent armed struggle in a universe defined by militant Islam. 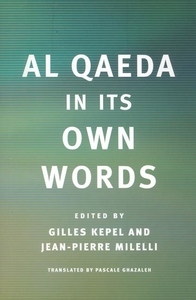 Substantial interpretive introductions to each leader's work and extensive critical commentary provide unparalleled access to the intellectual and doctrinal context of Al Qaeda in which these radical ideas have taken shape. By viewing Al Qaeda from within, this indispensable volume reveals the terrorist network's insidious role in the global web culture of today and the full dimensions of its frightening threat to world stability and security.